The Campaign Monitor Integration allows Quiz and Survey Master to integrate with the Campaign Monitor service. From there, upload the zip file that you downloaded when downloading the addon. Once the addon has uploaded, you should now have the plugin QSM - Campaign Monitor Integration listed in your list of plugins. Activate that plugin. Once activated, the addon will add a new tab in the Addon Settings labeled "Campaign Monitor Integration". Before you can use the Campaign Monitor addon, we must first enter in the license key and the Campaign Monitor API key. Enter your license key from your account into the "Addon License Key" field on the "Campaign Monitor Integration" tab of the "Addon Settings". To get started, log into Campaign Monitor. In the top right corner, you will see your name (or the name on the account). Click on your name. 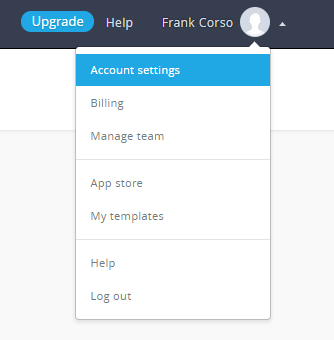 In the menu that appears, select "Account Settings". Once the page loads, you should see a page similar to the image below. Click on the "API keys" link. It will take you to a page like in the image below. You may have to click "Show API Key" to get the API key to appear. 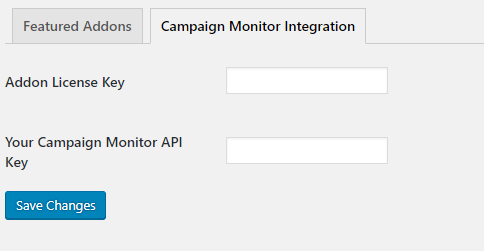 Copy the API key and paste it into the "Your Campaign Monitor API Key" field back in the "Addon Settings" page. Once you have entered your license key and API key, be sure to click "Save Changes" to save the page. Once your API key has been added in, you can use the new "Campaign Monitor" tab when editing your quiz or survey. 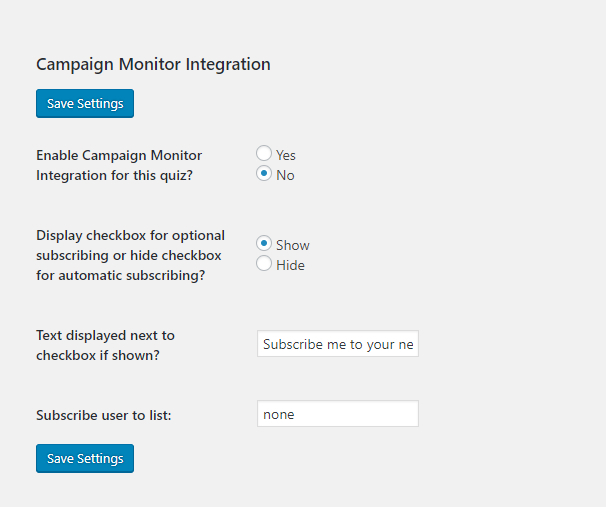 First, if you want this quiz or survey to be integrated with Campaign Monitor, then set the "Enable Campaign Monitor Integration for this quiz" to "Yes". 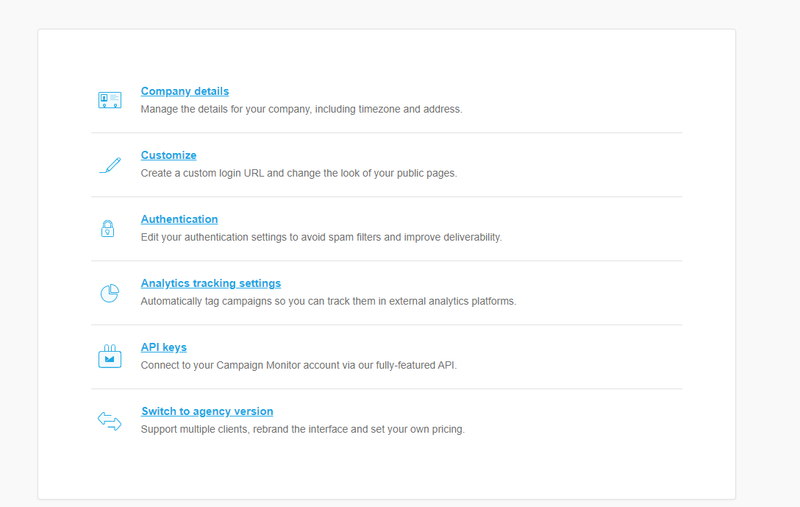 Lastly, you need to enter which Campaign Monitor list you would want to add the user to. To find the List ID, go back to your account in Campaign Monitor. Then, click "Lists & subscribers" at the top of the Campaign Monitor website. Then click on the list you would like to use. This should load a page similar to the image below. Underneath the list's name, you will see a small link labeled as "change name/type". Click on that link to bring up the edit page like in the image below. Copy the data from the "API Subscriber List ID" field and paste it into the "Subscribe user to list:" back in the "Campaign Monitor" tab of your quiz or survey. Be sure to click "Save Settings" on the "Campaign Monitor" tab when you are finished to save your changes.